Palestinian detainees in the Old City of AlQuds, during the British Occupation. Credit: Fox Photos, via Getty Images. Britain declared this past week that it intends to add the Lebanese political bloc Hezbollah ‘in its entirety’ to list of banned ‘terrorist’ organizations and to ban membership of or support for Hezbollah’s political wing. It was not surprising given the full-time lobbying that ‘Israel’ pushes into the UK Parliament. However, given the history of Hezbollah, a force of liberation and resistance against the occupation of the Zionist ‘Israeli’ entity and its big role in fighting off and eliminating takfiri terrorists in Lebanon and Syria, one has to stop and raise her/his voice in the face of Britain’s hypocrisy. The hypocrisy of UK’s politicians does not manifest itself only when it comes to pointing fingers at the region’s only force that has ever defied and crushed ‘Israeli’ aggressions, yet it simultaneously turns a deliberate blind eye to the history of colonial Britain that is nothing short of terrorizing due to the warmongering foreign policy of the UK in support of Zionism. One can easily make a massive collection of the UK’s historic atrocities committed with contemplation and determination to weaken and subordinate the natives within Britain’s colonies. Being an Arab from what the UK assigned “The Middle East” when it really is west Asia, the biggest atrocity I see committed by Britain in my region is its role in the illegal creation of Zionist ‘Israel’ on stolen Arab Palestinian land. The Balfour declaration was the moment that it became British state policy to support the creation of a “Jewish homeland” in Palestine. A hundred years ago, British Foreign Secretary Arthur Balfour wrote what was to some the Magna Carta of Zionism. To the Arabs, who ended up being violently dispossessed, it was a calamitous promise. As the British author Arthur Koestler famously put it, “One nation solemnly promised to a second nation the country of a third.” It was an early and foundational contribution from Britain to the world’s most intractable war still ongoing since 1948. However, the British role in terrorizing, stealing and colonizing Palestine started way before that. In 1917, the British colonial forces entered Palestine, and by 1918, the Ottoman rule over Palestine was ended following the defeat of its forces in WWI at the Battle of Megiddo in September 1918. Under the ‘Sykes-Picot Agreement of 1916’, it was envisioned that most of Palestine, after ending the Ottoman control over it, would become an international zone not under direct French or British colonial control. However, after the war, Palestine was occupied by the British Military from 1917 until 1920. During the period Palestine was under British occupation, the Zionists were putting pressure on the British Government to facilitate the establishment of a ‘Jewish Homeland’ on the land of Palestine. On the 2nd of November 1917, the British responded to the Zionist demands through what became to be known as the ‘Balfour Declaration’. Arthur Balfour, the British Foreign Secretary at the time, handed a letter to Lord Rothschild (a leader of the British Jewish community) for transmission to the Zionist Federation (a private Zionist organization). The letter declared the support of the British King’s Government to the Zionists’ plans of establishing a Jewish ‘national home’ in Palestine, as if Palestine is part of British land. All this was established at the hands of the warmongering psychopath of all time, Winston Churchill. Churchill’s own efforts to help establish a “Jewish national home” for the sons of Zion in Palestine were at their most intense throughout 1921 and 1922 when, as Colonial Secretary, he was directly responsible for the evolution of British policy in the Middle East. Since that date, Jewish immigration to Palestine, which started around 1882, increased rapidly. Conflicts erupted between the new Jewish settlers and the local Palestinian people, each fought for their survival. 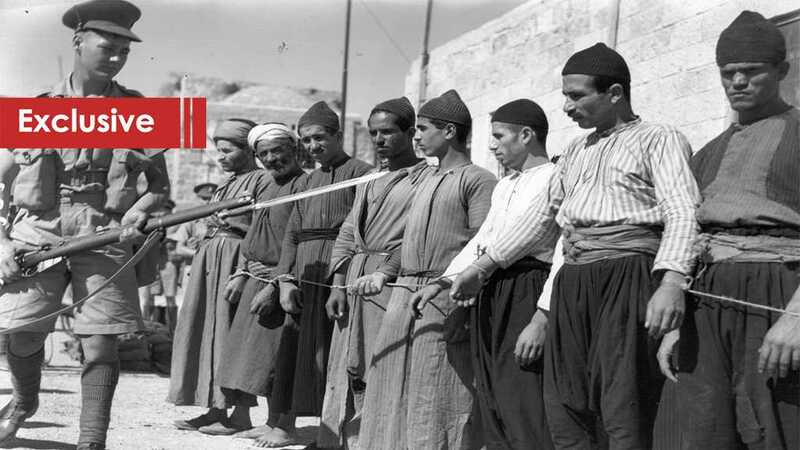 The Palestinian people rebelled against the British Mandate and its policies of settling foreigners on their land; meanwhile, the Jewish illegal colonial gangs continued to carry attacks on the Palestinian people as well as on the British mandate forces. So, the United Nations on the 29th November 1947 agreed upon a ‘Partition Plan of Palestine’, which would divide Palestine into two independent States; one for the Jews and another for the Palestinians, while keeping Jerusalem under international administration, by declaring it a ‘Corpus Separatum’. However, the plan was never implemented. Churchill, the British terrorist regarded the Arab population in Palestine to be a “lower manifestation”, declaring that the “dog in a manger has the final right to the manger”, by this he meant the Arabs of Palestine. In 1921, as he stood in the Palestinian city of AlQuds, Churchill told Palestinian leaders “it is manifestly right that the Jews, who are scattered all over the world, should have a national center and a National Home where some of them may be reunited. And where else could that be but in this land of Palestine, with which for more than 3,000 years they have been intimately and profoundly associated?” He blatantly stood on a foreign land and demanded its people to give it away willingly to a third party. His demands were not very subtle and diplomatic you see, they were done with guns pointed to heads of Palestinian natives. Obviously, the Palestinian Arabs refused to accept, and in London on 22 August 1921, they once more urged Churchill to bring a complete halt to Jewish immigration. Churchill rejected this appeal, telling the Arabs: “The Jews have a far more difficult task than you. You have only to enjoy your own possession; but they have to try to create out of the wilderness, out of the barren places, a livelihood for the people they bring in… they were in Palestine many hundreds of years ago. They have always tried to be there. They have done a great deal for the country. They have started many thriving colonies and many of them wish to go and live there. It is to them a sacred place.” As if to the Palestinian natives it is a place that they can just give up, because someone else who came from hundreds of miles away claims that Palestine is his, by religious right. You still find people in the west who read this last statement and actually agree with it, until you ask them how they would feel if Arabs decided to come back to Spain’s southern coast of Andalusia and claim it is sacred to them and start a one race/one religion state for them there. When you hear their deafening silence you understand that they know how wrong and illegal the creation of Zionist ‘Israel’ was, yet they don’t dare declare that in fear of being stigmatized as anti-Semitics, disregarding the fact that native Palestinians are the real Semites in this story and not the illegal European colonial settlers. Churchill stuck to his Zionist policy later in 1937, at the Palestine Royal Commission (Peel), where he stated that he believed in intention of the Balfour Declaration was to make Palestine an “overwhelmingly Jewish state”. On 19 May 1941, in a secret memorandum, he wrote of his hope for the establishment after the war of a “Jewish State of Western Palestine” with not only the fullest rights for immigration and development, but also with provision “for expansion in the desert regions to the southwards which they would gradually reclaim.” Even after the great theft of Palestine, Churchill was still promising the illegal Zionist settlers more free land for them to grab to the south of Palestine, meaning in both Egypt and the Arabian Peninsula. Even now, more than 100 years later, the British political, military and intelligence support for ‘Israel’ facilitates the ‘Israeli’ aggression be it against Palestine, Lebanon or Syria. In 2018, the UK pledged to increase “trade and investment” between the two countries, which already stands at a record 9 billion dollars as ‘Israel’ continues to murder Palestinian natives on a daily basis. Yet, one cannot find a single article in the British “mainstream” media noting the depth of supportive UK policies towards ‘Israel’ since the late 1890s to date. In 2016 and 2017, the UK sold 512 million dollars’ worth of military goods to ‘Israel’, including components for combat aircraft, tanks, drones and military communications and approved export licenses for 34 types of military-related equipment. No one seems to ask; for what? Or more practically; to kill whom? The UK wants to ban Hezbollah for being a force of resistance to the continuous ‘Israeli’ occupation and aggressions while at the same fills up the tanks of the most aggressive entity in west Asia, expecting the natives in that region to sit and watch instead of prepare to defend themselves. The UK’s military relationship with Zionist ‘Israel’ is extensive, covering areas such as naval cooperation and the provision of components for ‘Israeli’ nuclear-armed submarines. However, the UK chooses to brand Hezbollah as a terrorist group, all while ‘Israel’ has nuclear-armed submarines without being a signatory of the Nuclear Proliferation treaty. The British government revealed in 2018 that it was providing military training to ‘Israel.’ This followed news in 2016 that British military pilots were due to be trained by a company owned by ‘Israeli’ arms firm Elbit Systems. Training is longstanding: in 2011, it was revealed that British soldiers were being trained in ‘Israel’ in the use of drones that had been “field-tested on Palestinians” during the 2008 war on Gaza. So tell us again Britain, who exactly is the terrorist organization? Senior Arab political analyst and writer Anees Naqqash recounts how the British Empire played a decisive role in the creation and regional rise of the modern state of Saudi Arabia, and how the Americans later provided protection in exchange for control over Saudi oil. According to Naqqash, who is a prominent feature on Lebanese and Arab media, the Saudi royal family has for decades been used by the British and Americans due to their political and economic expediency. Naqqash was speaking at an event promoting his new book ‘A look at the course of future transformations to the Gulf’. Filed under: American Imperialism, British Imperialism, Western Hegemony |	Comments Off on Partition: Bad in Ireland and Palestine, Good in Syria?